Jingshan and Park as seen from the North-East corner of the Forbidden City,the former Imperial Palace. Jingshan Gongyuan is a park named after the Jing Shan, a man-made hill which sits inside its grounds. It is situated in the old city center of Beijing just north of the Forbidden City (Palace Museum). Important as a former Imperial Pleasure Garden of unique historical architectural style and with a close connection to the "Forbidden City" Jingshan Park was turned into a public park in the year 1928 AD and today remains one of Beijing's prime tourist locations. Covering an area of 230,000 square meters (about 57 acres), the park is larger than one would think on first glace and has several interesting sights to offer. The first and foremost attraction of the Park is no doubt the view that is offered from its beautiful look-out "Everlasting Spring" Pavilion (Wan Chun Ting). The Imperial Palace and the Jingshan , together with some other historic sites directly related to Beijing's Imperial History, make up the central and inner parts in the ancient Imperial Capital's lay-out. The ancient City, built in the 15th century under 3rd Ming Emperor Yongle (Yong Le 1403 AD- 1424 AD) follows the guidelines and principles of Geomancy or Feng Shui. According to Feng Shui tradition, along which's lines the entire Capital, Emperors Palace and the Ming Tombs were Built , bad influences -often seen as Ghosts or Spirits- descend from the North. Since the Jingshan sits on the north side of the Imperial Palace on the exact North-South axis of the City , the Jingshan acts in a similar way as the screen walls seen within the Palace. Sitting in a blocking position it acts to protect the Palace from Evil Spirits which may otherwise gain entry through its open northern gate. When approaching Jingshan Park from the east along Jingshan QianJie' one can enjoy a great view of the Palaces' corner watch-tower, the 52 meter wide moat and 10 meter high solid wall. On the other side, on the right, Jingshan, or prospect Hill is clearly visible with its Pagodas. There are 5 in Total , with the Wanchun Pavilion being the largest one in the middle. Located on top of the Mountain, on the central north-south axis of both City and Imperial Palace Grounds, the Wanchun Pavilion gives an excellent overview of the Palace Grounds. During high season tourists flock by along Jingshan Dajie' in groups and droves. For a few years it was the prime domain of rickshaw drivers who usually begged too a bit too persistently for attention. This nuisance was hoever corrected during the 2008 Olympic Games when a police booth was installed along the water side in order to maintain control over crowds and hawkers. The latter have since disappeared, except for the immediate area of Shenwumen and Jingshan Park south gate. As one may find however, at other times - outside the torusit season or after closing time - Jingshan Dajie is a calm boulevard and a great place to stroll. 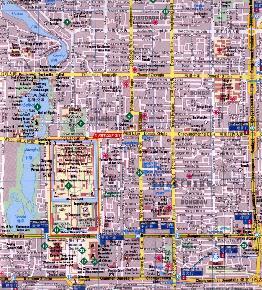 The Feng Shui basics have been applied to the entire City lay-out. So, accordingly this, The Northern Gate of the Imperial Palace, or Gate of Divine Militairy Might, is not the main Entrance to the Palace. Dynasty) the Main Gate and entrance to the Imperial Palace is located at the calm South Side of the Complex. As do all traditional Doors and Gates ( Men ) in the whole of China. When leaving the Gugong or Imperial Palace through its North Gate of Divine Military Might one is, as intended met with yet another astounding view. As a last spectacular encore to the scenes already witnessed within the Palace, the impressive Jingshan can be viewed in all its magnificence and Glory. The view of the huge Green Hill with its 5 pavilions stradling the hillside presenting alike a huge and pleasantly colorful screen wall is breath taking and makes the visitor, already dwarfed by the passing through a huge Gate in the Impressive Outer Walls of the Palace itself, once more humble. It is a beautiful scene. Enjoy the scenery as much as you can. On busy days and hours, much of the view of Jingshan can be blocked by tourist buses and the huge crowds passing in and out both Gates. Just beyond the protective zone of the exit if the Palace Museum ends and a small army of sales-men, hawkers, rickshaw drivers and others are awaiting a chance to get at your money or valuables. That is, apart from the mass of tourists and visitors streaming out of the Palace Museum on a good day, there is usually also a large gathering of people there just to try and make their living off the tourists stream. So, usually it is a coming and going of people during daytime, except for in the extremely early morning before opening times, or .. in evenings when only lovers stroll beneath the wall, enjoying the romance of the Palace and its lighted towers and some fishermen quietly try their luck at the corner of the moat. Some nights there is music for dancing at the North Gate, bringing locals in for a quickstep or some other fun together. Photographers can always be found scouring about the Moat, Wall and North Gate, looking for the best images and lighting of the Timeless Palace Museum. 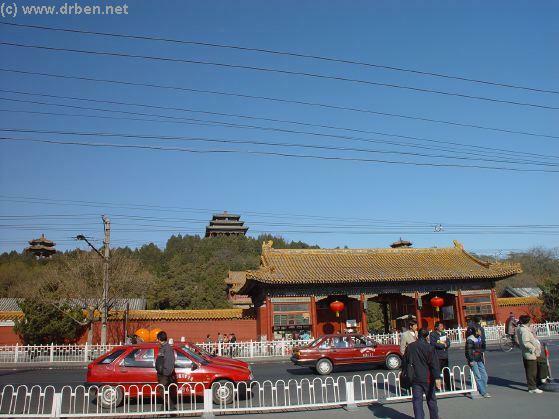 The Entrance to Jingshan Park , Jingshan and its 3 Pagodas overlooking Jingshan QianJie' (Jie' = street) and the North Gate of the Palace Museum. The Jingshan Park is open to the Public Daily from 6 in the Morning untill 7:30 pm Late. At Night Gates are locked. Entrance used to be special for Foreigners who received a souvenir-quality ticket, however currently all are equal under one price. 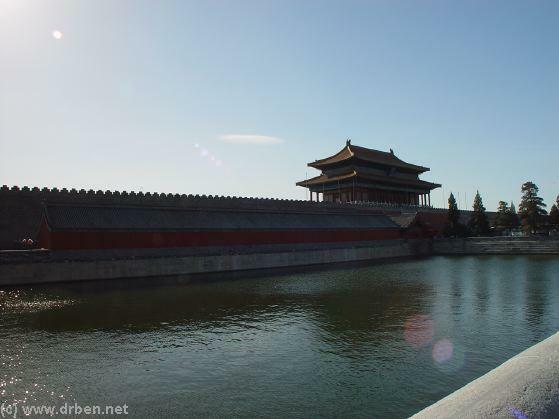 View of ShenwuMen, the North Gate of the Forbidden City, from across the Moat and the pedestrian walkway set alongside of it. 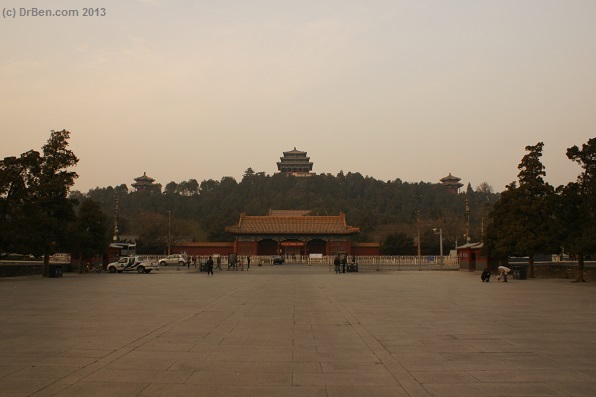 The View of the Coal Hill (Jingshan) and the Main South entrance at their intended best, as seen from ShenwuMen, the north gate of the Forbidden City (Photos: December 2013). The tourists however will keep flocking, and with them the ever present street-salesmen and women with maps, hats, silk, fake watches of useless quality and the like will come down to the north gate every day to try and make a sale. It is the usual racket: you name it, they have it. And if not, there is always the rickshaw tour, the Hutong Tour or some other tour to be offered to passers-by that look like out of towners. Regardless of the fact that street sales are now limited by city laws and a permit system and the police actively enforce them in this zone, scalpers and peddlers of low quality "souvenirs" are always on standby with the occasional pick-pocket intermingled. Enjoy your walk but please do beware and take care of your items and belongings. First view of Jingshan from the North-East corner of the Forbidden City and its Moat, a favored photography spot. Your Ticket provides a handy overview Map of the not-too-complex Park and Coal Hill Except for a walk over the Hill one can dwell around the Gardens near the East Gate and Guande Hall. legendary Tree and its breathtakingly magnificient lookout over "The Forbidden City (Gugong)" are now free for you to enter and walk around in. Keep your souvenir quality Tourist Ticket because it can serve as a handy map on your way to the Top of Prospect Hill. A Hint of what is to be seen inside : Go through the Gate and find a pleasurable spot at the QiWang Pavilion, now a Tea House of the Truly Chinese Style. Turn right and walk along the base of the Hill past rockeries and flowers to find the historic spot where the last Ming Emperor commited suicide in the face of inevitable defeat. There, around the east gate is a flower garden and much more. Go have a look around ! 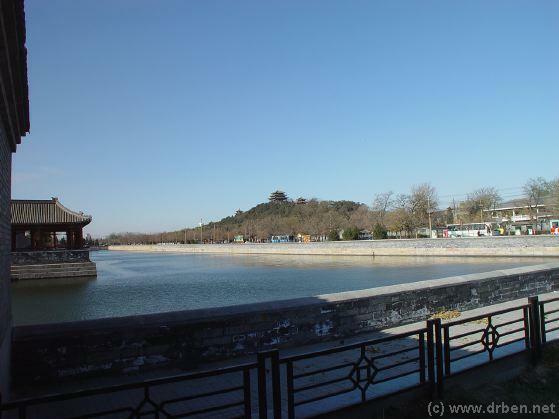 The Jingshan Park and its location are easily pinpointed within the city of Beijing. As part of the Dongcheng District of the Old City center, it is situated on the invisible central axis of the city and located directly North of the Forbidden City (The Palace Museum) with which it formed a continuum during the years of the last feudal Dynasty. 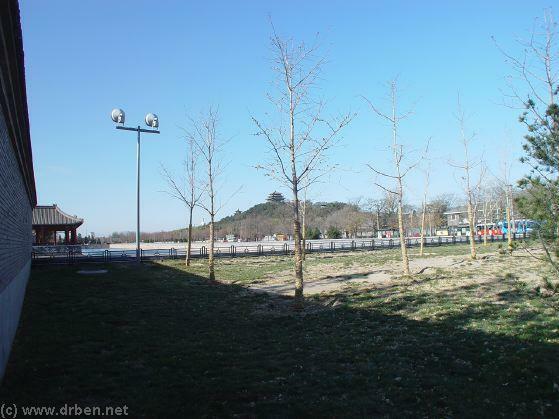 With 46 meters formerly the highest point in the entire city of Beijing, the Hill is clearly visible from many locations in the City such as from Drum Tower, from the main courtyards of the Palace Museum and so on. Although taking up one of the most visible and most central of locations within the most central part of the city of Beijing and easy to pinpoint on a map, in practice travel to Jingshan Park proper is not as easy as it may seem. A view of Coal Hill from the Eastern approach along Jingshan Dajie'. Due to the popularity of the Palace Museum and the Jingshan view, as well as the tours to the nearby Hutong Lanes, this is now a prime tourist hotspot. Head East from Jingshan to find the China National Museum of Art a huge Complex ! 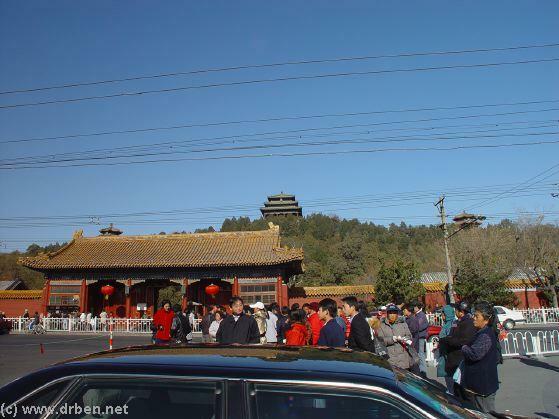 Hawkers and Fake-Rolex Peddlers crowd about between the Palace Museum North Entrance and Jingshan's Southern Gate while Taxi's whizz by. Souvenir-Quality Ticket from the year 2002 AD. During Tourist high-season (May to Sept.) Polite and Uniformed Staff is at hand to help solve any of your problems. Beijing Cities' Largest and Perhaps most Beautiful Park - Beihai or North Lake. Located North of the Imperial Palace Museum and due West of Jingshan this very large former Imperial Pleasure Garden is home to evergreen Jade Island, the Yong An Imperial Buddhist Temple Complex and much more. Park through 1000's of Photos leading you past most interesting sights, through the Park, over Jade island, through Temples all the way to Bai Ta- the Fabled White Dagoba with the protector God of Beijing. The scenic Route along the Northern Moat to Shenwu Men - Gate of Divine Might. The police measure taken earlier by the City Government in an attempt to preserve some harmony and order at this spot has helped considerably and the massive crowds flowing through are now better regulated. The Five Main Pavilions as well as the remainder of Jingshan Park were under renovations in (May of) 2006 AD in preparation for the 2008 Season. View of Jingshan and Forbidden City Watchtower at Dusk. Beijing Police supervision at Shen Wu Men, Gate of Divine Might. The athmosphere ismore relaxed now that Torubusses have been banned from Parking at the Gate. Due to its close proximity to the former most important building in Beijing, the Imperial Palace, of which Jingshan was an extension during the Qing Dynasty, Jingshan and its Park are surrounded by other historic monuments and places. First of All, due West of Jingshan lies the Beihai or North Lake Park, another Qing Dynasty pleasure Garden and extension of the Palace and part of the Imperial City. South of the North Lake lie the middle Lakes, also known as ZhongNanHai, the current compound of the High Political Leadership of China and families. Both splendid Lake Areas are visible from the Top of Jingshan. Next should be mentioned the Avenue due East of Jingshan Park. Here, at the end of Jingshan Dajie' at the corner of the Palace Moat, Jingshan Dajie' extends further Eastward (with a turn north) as Wu Sie Dajie'. This Street is also know as the Avenue of the May the 4Th Movement, a Monument to which can be found down the Boulvard adjacent the China (National) Art Gallery. 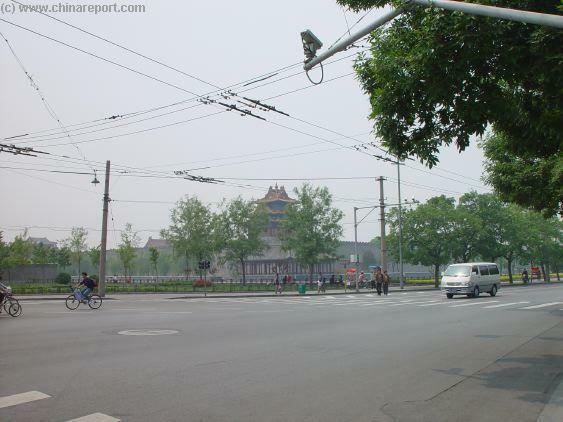 The North-East Corner Watchtower of the Palace Museum and intersection of Jingshan Dajie' , Nanchizi Dajie' leading South and Wu Si Dajie' Avenue of the May the 4Th, a historic protesting Route of Beijing Students. On December 12Th 1936 ADProtesting Students were massacred here by the KuominTang Nationalist Government Police. Map of DongCheng District with Location of Jingshan Park. Click Map for Full Version. A Walk over " Prospect Hill "
As a result of the relative lack of access to this busy and usually bustling area, most times a trip to Jingshan Park involve a lot of walking and hiking. That is, of course it is always possible to have yourself dropped off nearby after taking a Taxi Cab, however when traveling cheaply and without fuzz it usually comes down to some foot work. The good news is that there is plenty to see along any route leading to the Coal Hill and Jingshan Park. The most popular route to Jingshan Park is to tour through the Palace Museum and then continue onwards from its North Gate (Shenwu Men) to cross the road into Jingshan Park. 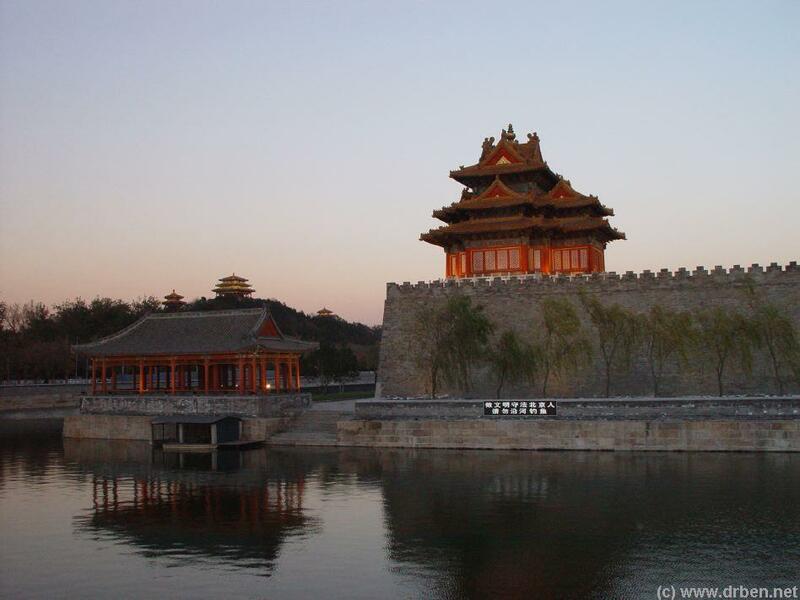 This is not only the most convenient and visually and mentally most stimulating route, it is also the historically logical route of travel from south to north along the magical central axis of the city of Beijing. 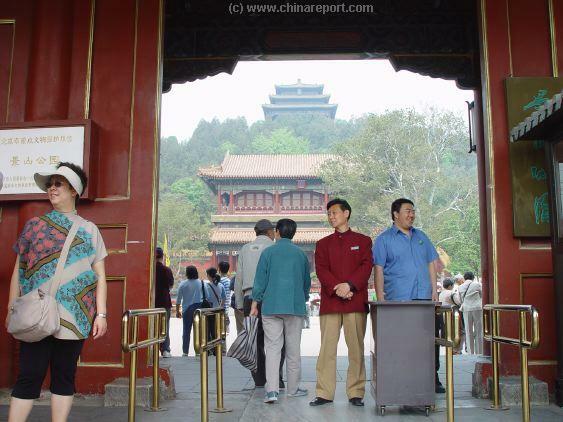 In this case, enter via the south gate of the Forbidden City and just walk your way upwards from there. This route is lenghty and scenic, so best allow for plenty of time along the way. At 46 meters high this pavilion riding atop the hill used to be the highest point of the city of Beijing. 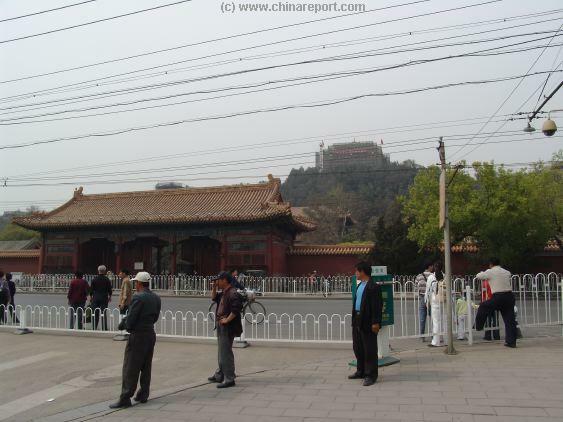 Today it is a most popular place from where one can overview the grounds of the entire Palace Museum. Naturally, one has to hike to the top of the Coal Hill or Jingshan, to be rewarded with the view. Secondary popular sights within the Jingshan Park are the so called "Chongzhen Emperor Hanging Tree" which marks the location where last Ming Emperor committed suicide in the fateful year 1644 AD when his Dynasty ended, the various pavilions found riding along the rim of the coal hill, a superb Rose and Peony Flower garden and last but not least the almost hidden Palace of Imperial Longevity (Shou Huang Dian), the latter being a former Temple Altar to the previous Emperors of History which has been taken under renovations in December 2013. Formerly the location of the Palace of of Imperial Peace was taken into use by what is known as the Beijing Children's Palace, a special school for talented children under auspices of the Communist Party of China. This historically interesting elite school has however recently moved out entirely and the north end of the Park where the Palace of Imperial Longevity is situated will be rejoined with the park and open to the public after its restoration. In history the Jingshan and Park were a favored dwelling place of the Emperors and an Imperial Pleasure Garden off-limits to the General Public. Today it is a bustling Park with many visitors, both local and Foreign. Of all the many places to see in Beijing it is no doubt one of the most splendid. , so a quick ride in followed by a short walk is not an option. In addition to the lack of subway access, the traffic surrounding the hill is usually also a mess which makes an attempt to travel by Bus or by Taxi less attractive. 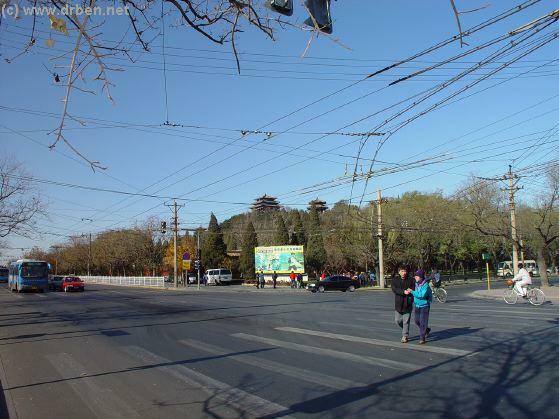 Judging from our personal experiences, several bus lines do pass the Jingshan Hill, but they do so via Jingshan Road, which is one of the busiest thoroughfares in the area. Travel time can be high as buses loiter in traffic along this main thoroughfare indefinitely. Image map to navigate your way around the area and find your directions inside the park. Currently, the nearest subway station is Dongsi (East Mosque) from where one can walk westward to get to Jingshan. Along the way one can see the Monument to the May the 4Th Movement and the China (Modern) Art Gallery. The route in brief is as follows: Take Subway Line 5 to Dongsi Station. Get out from Exit C and then find bus 101 to Gu Gong (Forbidden City) Station. 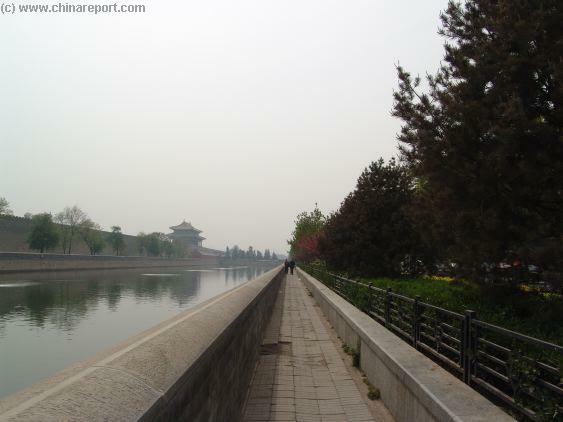 It is opposite to the north gate of the Forbidden City (Palace Museum). It is Jing Shan, or " Prospect Hill " within the Park that gives the Best and most Beautiful View of the Forbidden City. 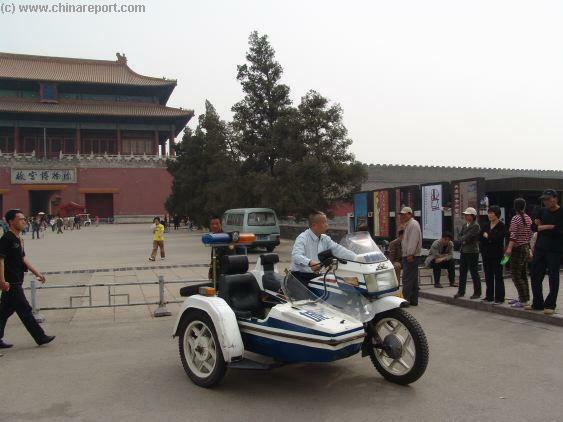 Jingshan Park however has considerably more to offer to its vistors. As for the greater Feng Shui plan behind the lay out of the city: whereas the Palace has the Jingshan to shield its gates, the larger city of Beijing has the Feng Shui properties of the surrounding Jundu Mountains to shield it from bad influences eminating from the north. Even before the city was taken under construction, the geomantic features of the entire region had been carefully reviewed and the site to build the city was chosen as the best location among things due because of the protecting ring of the Jundu Mountains arching around it from the north east to the west. A similar arrangement was made for the site to build the Tombs of the Ming Emperors, which are situated due north west of the city in a tomb valley in which the structures are surrounded by their very own set of walls and a miniature ring of mountains. In addition to all of these Fortifications, real or magical, on top of the Jundu Mountains there later emerged yet another barrier, the screen wall of the Great Wall of China which runs via Simatai in the east to the Badaling Pass ( Great Wall of China) in the west in protection of the city. thought of as having the function of combatting or pacifying the malevolent emanations from the north. As with everything, the entire mountain and park again are surrounded by their own protective wall. Altogether, when completed the city of Beijing created under the auspices of the Emperor Yongle was similar to a Russian stacking doll. It was a City within a City, with inside another small City with a Purple Wall. That innermost city with the Emperor as the innermost doll, is now the Palace Museum, but in history it was Forbidden to any non-invites, punishable by Death. Although the Police keep the hawkers at bay forcing them behind a fence well away from Shenwumen Gate, the hawkers are not about to relent and often an amusing game of cat and mouse can be seen playing out on this spot. and within stood the huge Imperial Palace. Even within the Palace each seperate Palace Complex is within its own walls.